Even though a rustic theme calls for a naturalistic look, a good design is just as important as it is for a more formal setting. Towne Tree and Landscaping can help you perfect your backyard design while injecting character and charm into the setting. Here we’ll take a look at some of the design elements you can include in your Scituate, MA, backyard to add that comforting, rustic feeling and authenticity. Natural stone, such as flagstone, is an obvious choice for rustic designs, providing irregular shapes and a high degree of visual interest. However concrete pavers should not be discounted. With their rich variations and a wide array of shapes and sizes, concrete pavers can be an excellent alternative to natural stone and are often indistinguishable from their natural counterparts. Their range of sizes means that although they may not offer the same irregularity of flagstone, visually interesting, randomized laying patterns can still be achieved. Both natural stone and concrete pavers can be woven into beautiful meandering country-esque walkways, and cozy rustic patios. Wood is also an important feature of rustic design and can be incorporated into hardscapes in the form of decking. This is an excellent solution for creating outdoor living spaces embedded in densely wooded backyards with the least impact on the environment. Your backyard will definitely need seating space if it’s going to provide you with anything more than just good views. To maintain a rustic look, go for furniture that is rich in natural texture and warm, earthy coloring. For example, furniture made out of wood or wicker can help to complete the look. A picnic table or classic long, solid farmhouse style table with benches provides an excellent rustic addition to the landscape. Alternatively, permanent seating built with units steeped in rugged beauty is a great way to go. Backyard ornaments and décor to complement a rustic theme include upcycled, vintage and natural elements. Old farm equipment and reclaimed wood are always great options for introducing a touch of rustic charm. Wagon wheels, railway sleepers, milk cans and raw timber can be repurposed to give your landscape a hint of the country. Consider, for example, including a railway sleeper walkway through a deep plant bed to allow easier access, or incorporating logs as casual landscape seating. Water features such as waterfalls, streams and ponds are also perfect elements for adding more natural beauty and serenity to your landscape. Similarly, natural stone, stone veneer, or naturalistic concrete fireplaces and fire pits are an excellent way to add comfort, warmth and an enjoyable rustic ambience. A rustic backyard design would not be complete without plenty of plants and flowers. Large trees with richly textured bark are also a must. 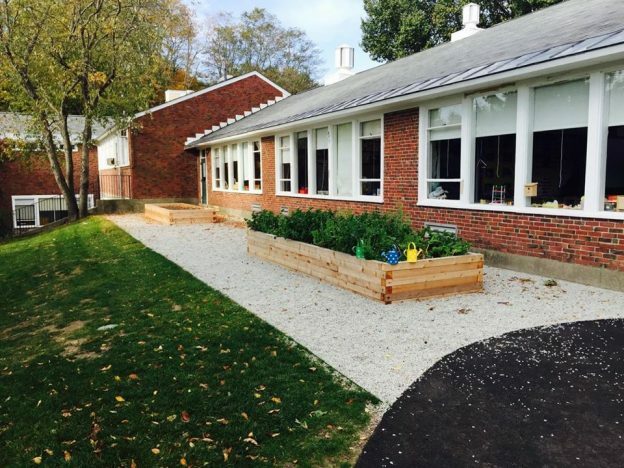 If space is available, why not have a vegetable garden installed and try your hand at growing produce such tomatoes, peppers, onions, and carrots. This not only adds to the rustic theme but contributes to the dinner table as well! This entry was posted in Design & Construction and tagged Backyard, Concrete Pavers, Landscape Design, Natural Stone, Outdoor Furniture, Patio, Plantings, Rustic on September 30, 2017 by 12850420. Days are getting shorter, nights cooler – a sure sign that fall is approaching in Milton, MA. If you’re looking forward to staying toasty, now is the best time of the year to install a fireplace, before winter arrives in full. Winters here can be frigid, making temperatures and flurries of snow the norm – a good reason to start construction on any project now. Fall is a great time of the year to enjoy mild weather and blooming fall flowers. It’s also a great time to add a supplemental heat source to your outdoor living area. 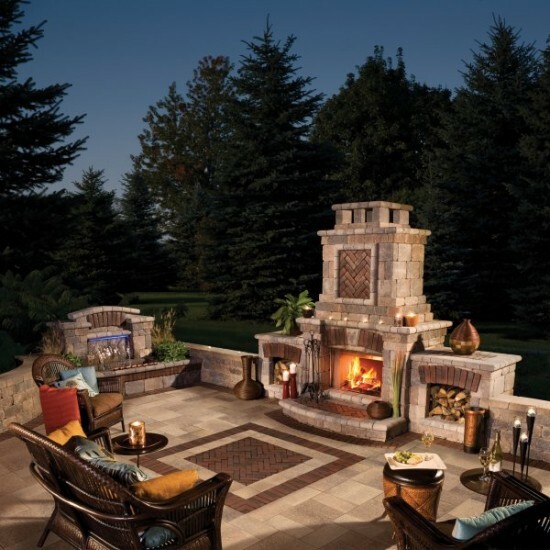 It’s wise to get a headstart by having an outdoor fireplace installed now while contractors are more available. With spring and summer projects out of the way, contractors are freer with their schedules and will be able to slot you in for the construction of a new outdoor fireplace. They’ll also be able to give more attention to the choosing of materials and construction while completing the project faster with the deadline of winter just around the corner – just in time to invite family, friends and guests to take advantage of the fireplace in the cooler weather. Fall is also a convenient time of the year for homeowners that want to remodel an outdoor space, since summer can often be a busy time in the yard with family gatherings and kids on break. But with schedules returning to normal in the fall, construction in the yard poses little inconvenience, particularly with such a easy-to-install feature as an outdoor fireplace. If you’re loathe to see the end of the sunny days and warm nights of summer, an outdoor fireplace can help you extend that summery feeling that little bit longer. Keep the season of outdoor socializing going by having an outdoor fireplace installed and firing it up for warmth and evening enjoyment. The sounds of a crackling fire in the fall is sure to bring back the memories of childhood camp outs, nights around a grill roasting marshmallows, and other enjoyable experiences. There’s no doubt that the sound of a crackling fire creates an environment of peace, relaxation and nostalgia. Because the summer heat is now past, a fireplace is essential for enjoying a fall evening outdoors. The warmth a fireplace produces is both comforting and relaxing – a definite benefit of having an outdoor fireplace in the fall. Because of the drop in temperatures, a patio can become unusable unless additional heating is installed. The heat of a fireplace is often all that is needed to beat back the bite in the air, particularly if your patio has additional wind protection or covering. In fact, enclosing a patio with a permanent roof structure and vinyl or glass siding can be a great way to continue to enjoy the space through winter. This entry was posted in Design & Construction and tagged Choosing a Landscape Contractor, Fall, Landscape Construction, Landscape Design, Outdoor Fireplace, Outdoor Living, Patio on September 23, 2017 by 12850420. Choosing natural stone for your patio space is, in effect, making a commitment to authenticity with your landscaping plans. While these options are often more expensive and require more maintenance than manufactured options, the aesthetic and quality provided are unbeatable. The choice of natural stone for your Milton, MA, patio will depend on the color, purpose, and maintenance desires of your patio purposes. Limestone is a popular natural stone for good reason. Used frequently both inside and outside of the home, limestone is naturally non-slip, quick to dry, and unique. Color options for this stone range from a light tan to dark green with an array of choices in between. This option generally remains cool to the touch even in sunlight and will withstand the tests of weather, time, and living. 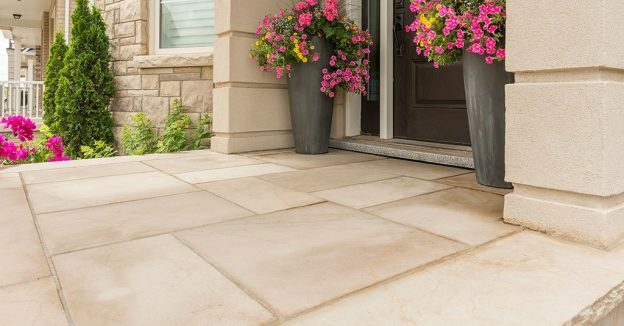 With a high degree of durability and an appealing range of natural colors, sandstone provides an exceptional solution to the patio paver conundrum. Sandstone’s warm, inviting colors make it an excellent option for creating sunny seating spaces and resort-like poolside surrounds. Routine cleaning and maintenance will be essential, but when completed appropriately, a patio made from sandstone will serve property owners for many years to come. The advantages of using granite for your patio construction are numerous. The primary benefit is the sheer strength of the material; it is extremely difficult to chip, crack, or break. In addition, the aesthetics exude commanding strength and naturalness. Moreover, the texture is naturally anti-slip because of its somewhat rough texture, making it an excellent choice for patios near pools. It’s also highly durable, even against chemicals and heavy wear, as well as fire resistant. 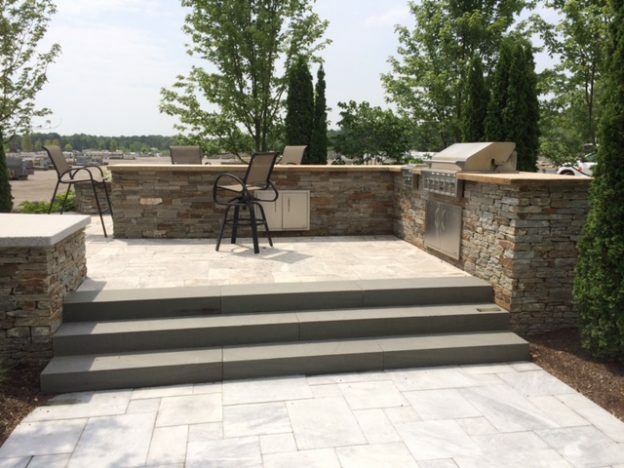 Granite is therefore an ideal choice for an outdoor kitchen space or for the floor of the space where the grill or fire pit will be located. The unique appearance of slate, along with its uniformity, makes it a popular choice for outdoor constructions. For a unique, classic, and quality patio, slate is an excellent option. The pattern created can be changed by simply rotating the direction of the paver. For your particular patio goals, consult a Towne Tree landscaping design professional for assistance in choosing the best natural stone and designing the layout of your patio. Bluestone is another stellar option as a natural stone patio construction material. It works well with other natural materials and can be cut to size or shape fairly easily, making it ideal for patios in particular. Moreover, it is durable and an excellent choice for pool decking areas. This dense, hard material can withstand weather extremes as well as the rigors of outdoor living. Color options are quite diverse and can range from yellow and blue to purple and earthy tones. Versatile and durable, flagstone pavers offer many benefits to patio construction. Absorbing little water and being densely structured, flagstone can withstand temperature extremes and will last dependably for many years. Homeowners can choose from a variety of colors, shapes, and sizes, but the material consistently offers an extraordinary aesthetic with a richness of quality and durability. This entry was posted in Design & Construction and tagged Landscape Construction, Landscape Design, Natural Stone, Patio, Walkways on September 18, 2017 by 12850420. Most plant diseases have the ability to survive during the winter period hidden within infected debris. Plant diseases can be found in the soil, fallen leaves, and dead branches that belong to the infected plant. So, hiring professionals that will remove all the debris and minimize the number of diseases before the winter starts will assure your garden contains only healthy soil ready for plantings. Aside from preventing plant diseases, a thorough professional cleanup of dried leaves and other organic material will prevent their rotting becoming a breeding ground for mold and fungi. Fallen leaves and debris can also keep the lawn from getting enough sunlight, which it will need for later spring growth. A tree inspection needs to be done by a professional that can recognize various symptoms of tree diseases and infections. A professional will also be able to take further actions for the prevention and treatment of tree disease. A common sign of infection is twisted and curled leaves. If you notice any of these signs, call a professional to prune or remove the damaged tree before the winter, or better yet, have your trees inspected to give you peace of mind. Snow and ice may cause damaged limbs to break off during the winter, making them a major hazard for you and your home. The removal of these during fall will help limit winter damage to your property. For homeowners that are interested in planting new perennials, cooler October temperatures create the ideal conditions for their growth. Towne Tree and Landscaping, Inc. can advise you on the best choice of trees and shrubs for your lawn for fall planting. These plants remain dormant through the winter and have enough time to develop strong roots in preparation for summer. Planting now is the best way to ensure bright colors and rich textures for your landscape come spring. Performing a soil test will give you valuable information about the condition of the soil in your landscape, determining the nutrients and pH requirements of your lawn and plants. If there is a need for making corrections by adding the right fertilizer, the soil will have plenty of time to repair before spring. Fall is the perfect period for an annual lawn fertilization by a landscape professional. You can perform this process during spring, but because the roots of many plants continue to grow in the winter, providing nourishment in the fall may be necessary. Consult with our local landscaping professionals to determine the fertilization requirements for your landscape. Aeration is a process usually performed during the fall and spring. This helps to break up compacted soil and ensure sufficient water and nutrient absorption before the winter frost takes hold. This entry was posted in Maintenance and tagged Landscape Maintenance, Landscaping Services, Lawn Care, Plantings, Tree Care on September 12, 2017 by 12850420.